First discovered in the Great Lakes in 1988. 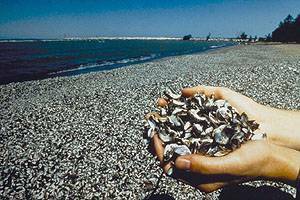 Within one year, zebra mussels colonized every firm object in Lake Erie. Zebra mussels have quickly spread to all the Great Lakes. Expansion into Midwest inland lakes has continued at an alarming rate. 100 lakes in Wisconsin are now infested. Much of the Mississippi River, Ossawinnemakee, and Lake Mille Lacs in Minnesota have been identified with zebra mussels.